I felt bad that I wasn’t impressed by the 150-lb cupcake that set the Guinness record for World’s Largest Cupcake. It may have been big for a cupcake, but it also didn’t look to be much bigger than some cakes I’ve seen (and smaller than others!). But the record has been broken with a cupcake that is a bit more impressive – nearly 10 times more impressive – than the original. 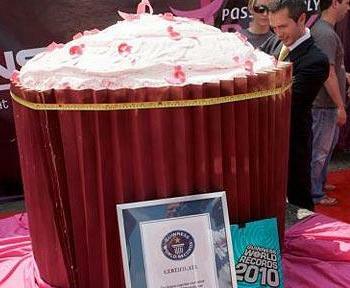 GourmetGiftBaskets.com broke the record this past week with a 1,224-lb cupcake, unveiled in Detroit. The half-ton pastry was filled with a vanilla custard and was baked in a specially-designed pan, not make of smaller cakes stacked together. It was over 11-ft around and made with 200 lbs of flour, 200 lbs of sugar, 200 lbs of butter and 800 eggs (amongst other ingredients). As impressive as this cupcake is, it’s worth noting that the company originally set out to bake a 7,000-lb cupcake. While live-blogging it’s progress on Twitter, that cupcake – also baking in a specially designed pan – “suffered catastrophic failure during the 40 hour baking process. Weight of cupcake rising crushed a major convection tube.” The project had to be scaled back at the last minute to meet their deadline and preserve the rest of their kitchen equipment. 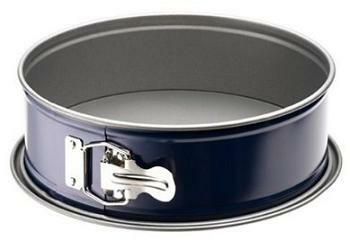 Why use a springform pan? Next PostNext Why use a springform pan? Wow that is one big cupcake. I couldn’t even imagine what a 7,000lb. cupcake would look like! Wow! I can’t believe they attempted to cook 7,000lbs at once. I figured even the smaller 1,500 lbs cupcake was just layers of cake. Such a big cake! i never seen before. Hey does 7,000lbs cake is ready? What a gigantic size cupcake! such a remarkable cake i hardly see.